TS Panchayat Secretary Result 2018 – The Commissioner of Panchayat Raj and Rural Employment (TSPRRE) has released the District wise Rank and Marks of each category. The exam for which the rank list is announced was held on October 04, 2018. 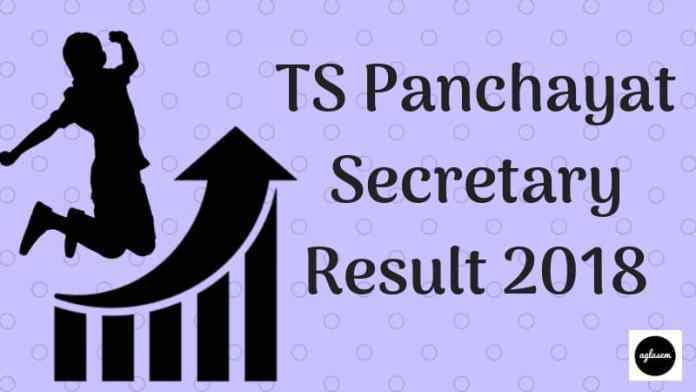 The TS Panchayat Secretary Result 2018 was declared at www.tspri.cgg.gov.in, on December 19, 2018. The candidates who have appeared in the examination can check their marks and rank now. The rank has declared in the form of the pdf file which contains mark, rank, and category. District wise result has been declared. From the result, link is given below candidates can check their result. The result is containing the roll number of qualified candidates only. From this page, candidates will get full information regarding TS Panchayat Secretary Result 2018. Latest: The TSPRRE has released the district wise rank list for Panchayat Secretary. Scroll down to check the same. Some of the districts have provided the direct link of the result. All district wise result is available for checking the result candidates have to enter the login credentials at the result login page. For more information regarding TS Panchayat Secretary Result 2018 check the schedule given below. District Wise Rank List: Click here to check the Rank List of TS Panchayat Secretary. New! OMR Sheet: Click here to check the OMR Sheet. Result: Click here to check the TS Panchayat Secretary Result 2018. Question Paper Booklet Sets & Final Keys: Click Here to check the TS Panchayat Secretary 2018 Question Paper Booklet Sets & Final Keys. District Wise Selection List: Click here to check the TS Panchayat Secretary 2018 District Wise Selection List. For checking the result candidates can follow the steps given below. After viewing the result candidates should take the print out of it for future reference. Fill the login credentials such as Hall Ticket (or) Registration Number and DOB at the login page. After entering all the credentials click at the download button. Thereafter select the district wise result which is related to you. Merit List is based on the scores scored by the candidates in the examination and on the basis of the ranking. Merit list is in the form of pdf. District wise merit list has been released. Merit List is containing the name and roll number of the candidates.